I got this blog post by a great design mentor I decided to follow very recently. As I read through the very interesting article, I was really laughing my heart out. It just brought memories of a similar article I put up on my blog some time ago. 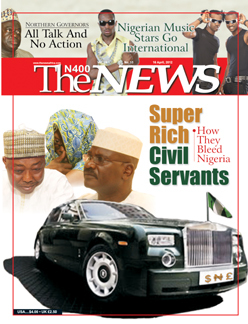 Whereas governments, either military or civilian, come and go, civil servants are always there. Even when there is a civilian-to-civilian transition, they are present. They are largely anonymous. But when the chips are down and a push comes to a shove, it is the politician that is the fall guy. our proposed cover design for this week. Looking at the expressions on the faces of the victims used here shows so much sorrow, grief, pain, despair and horror brought on them by the evil perpetrations of the Boko Haram sect. This design option seeks to draw emotions from prospective readers. The human factor element was a major consideration for us in putting together this cover design. Based on the concept (option 1) we had in mind, we took quite some time to choose photographs of the Boko Haram bombings victims. The pictures were really quite touching as one could feel the pain, grief and sorrow affected people suffered. The feeling was virtually as though one could touch it. It was conspicuously written all over them. Your heart would bleed indeed if we could show you the very gory and really humanly offensive photographs of victims being rescued. Some of them had their legs ripped off their bodies by the bombs. It’s really nothing to write about, REALLY it isn’t! Some of the pictures we finally chose were taken to Adobe Photoshop and traced to suit our layout in Coreldraw. The photographs was then placed in Coreldraw and other elements added before we exported the whole elements to Adobe Indesign and finally re-exported same as a pdf file for our print bureau. Falling on the lap of one of our very finest writers, fresh from an International Writers’ Residency in Iseyin, Oyo state, Nehru Odeh, this week’s cover story with the headline, ‘Marital Violence And The Secret Pains of Victims’ was quite an interesting one for the creative team. 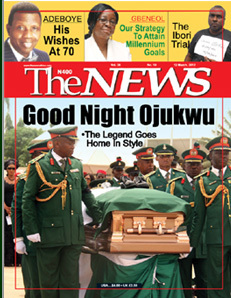 This week’s cover, “Good Night Ojukwu: The Legend Goes Home In Style” is the third (two have been consecutive) we have done on the departed Dim Emeka Odumegwu-Ojukwu, t he Ezeigbo Gburugburu. Why? Given what the man stood for among Igbos and Nigerians, Ojukwu, in life and death, deserves the honour. This particular honour, in its most dramatic and literal sense is what we sought to project in our cover design for the week.